July was a horrible month for precious metals prices. Sentiment reached levels never seen before. As metals and the miners broke through a long-term support line, so did pessimism. To get an idea of the level of pessimisim, we are including a very long-term chart going back to 1992 (courtesy of Sentimentrader). As readers can see, market sentiment in the last two years is worse than the bear market lows of 1998 – 2000. "Can precious metals go lower from here? Yes, no doubt. But, if we get a breakdown, then a sharp V-shaped recovery should take place very quickly. In that sense, timing the bottom is a fool's game. Investors will be chasing the gold price, with little success whatsoever." 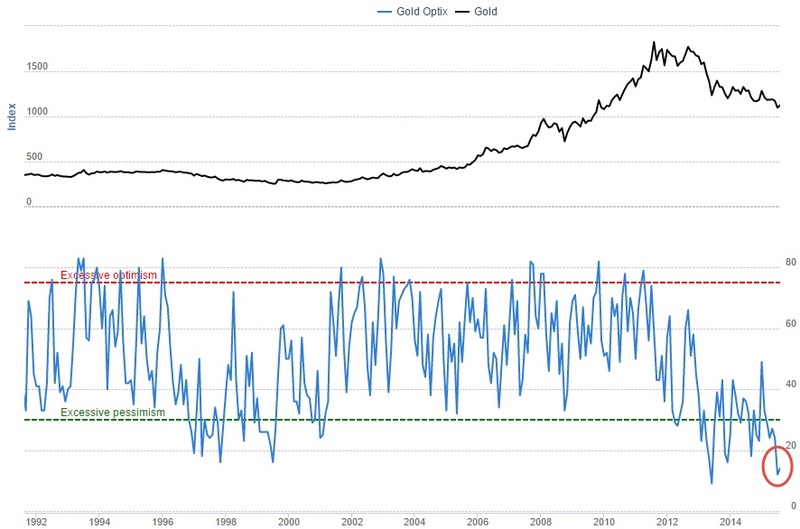 "Although we do not believe that markets trend higher or lower based on 'reasons', we still think there are two signals that indicate there is not much downside left for gold. So rather than panicking, we look at the level of hate surrounding the gold market, and we become more bullish by the day. We believe that smart investors should be preparing their shopping list right now, instead of reading mainstream media headlines about gold." Indeed, it is our job to guide investors through rough waters in the markets. When we become contrarian, there is a good reason for that. Gold, silver, and miners are undervalued. The correction has been too long, too sharp. Over time, a mean reversal will take place. Gradually increasing positions in undervalued assets is what secular investors should do in order to tap into the potential of the market. Investors are faced with a serious challenge: how exactly to play the beaten down precious metals sector? If anything, investors must avoid too much risk when putting capital at work. First rule: always stay diversified when it comes to your investments. It is imperative that the holdings in your portfolio are sufficiently spread across assets and segments (stocks, commodities, precious metals, countries, etc). This is such a 'cliché' that most investors are simply neglecting it. But a well diversified portfolio allows to grab the opportunity of collapsing precious metals, which, at some point in the future, will reverse their downtrend. Because of the technical damage, repair time itwill take quite a while. Meantime, secular investors should be using their time to analyze which companies are able to survive this storm, in order to make up their shortlist of future ten baggers. Second rule: only add gradually to your positions. That assumes that your additional positions remain relatively small. It also assumes that you have, at all times, liquidity available. Picking a bottom or a top is a fool's game, so your positions need to be managed, literally, over time, based on the evolution of the market. Fourth rule: your portfolio must be future proof. In today's world, that means that you should anticipate rising interest rates. One of the key themes at Secular Investor is that the top of the bond market is in, so investors should prepare for a world of rising interest rates (hence, lower bond prices). That means that your selection of assets and stocks should not contain companies that are heavily indebted. It definitely adds to the complexity, but we believe it will largely pay off in the future. Stay calm, focus on the big picture, manage your investments ... and above all, manage your emotions. Secular investing pays off over the long-term.